Second volume of Just Lassen To Me! now available on Amazon | Just Lassen to Me! Is it possible to admire a man’s accomplishments but abhor what he stands for, to seek his blessing but spurn his legacy? What if that man is your father? Now thirteen years into its making, Harvy Simkovits’s enthralling memoir series Just Lassen to Me! continues into its second volume. It’s the continuation of the true, enthralling family and family business tale behind the big businessman, Johnny Simkovits, and his disaffected wife and feuding adult sons. Book Two: Survivor Teachings takes a deeper dive into the makings of Johnny, how he built his business and amassed his fortune. Johnny gets caught by the taxman for creative but illicit accounting practices, but survives to scheme another day. His second son, Harvy, tries to separate himself from his dad’s dubious dealings, but continues to be pulled back into his father’s finagling and family’s feuding. Can Harvy reconcile, repudiate, and rectify his mom’s painful burdens and patriarch’s illegitimate legacy? Written with honesty, humor, and humility, this is a continuation of a first-generation son’s story of surviving his turbulent family and survivor father. Kirkus Review of Just Lassen to Me! Copyright © 2017. 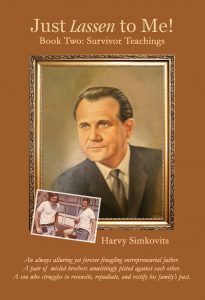 Harvy Simkovits. All rights reserved.